KitchenAid. It’s the one and only – the ultimate chef’s aid. Not a chef? That doesn’t matter! KitchenAid appliances will slip in to your kitchen as though they have always been there, and suddenly all of your previously time-consuming kitchen preparation tasks will become a thing of the past. Whether it’s a blender, a mixer or a food processor, KitchenAid will blow you away. And speaking of being blown away, few appliances in the kitchen world are as archetypal as KitchenAid’s range of stand mixers. In fact, the company’s name is just about interchangeable with these kitchen machines. Just because it’s a little smaller, don’t underestimate the Artisan Mini! 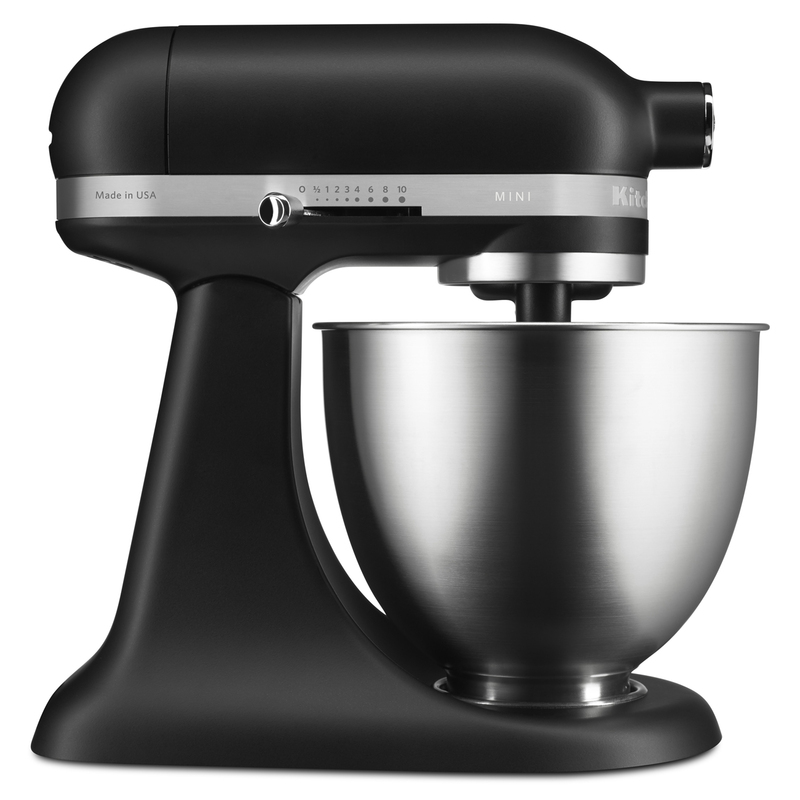 It’s everything you love about KitchenAid’s popular KSM150 model…just a bit smaller. Boasting the same energy-efficient motor, exceptional planetary mixing action that gets to the very side of the bowl, dozens of attachments and of course the all-round retro look and feel, the Artisan Mini is here in a range of fresh colours to reshape your kitchen for good. Die-cast metal construction with anti-slide feet on base. 25% lighter than previous models. 20% smaller footprint than previous models. 3.3-litre stainless steel mixing bowl. Powerful yet energy-efficient 250 watt motor with direct drive transmission. Planetary mixing action ensures ingredients are mixed quickly, evenly and efficiently. Slide bar helps you select from ten different mixing speeds. Tilt-head design allows easy access to the beater and bowl. Multi-purpose attachment hub lets you attach other KitchenAid attachments, available separately. 3.3 Litre Stainless Steel Mixing Bowl. Dimensions: 31cm x 19cm x 31cm. If you're shipping this product overseas, please keep in mind that all our electrical appliances are fitted with Australian/New Zealand electrical plugs and are designed to be operated on 230V/50Hz as standard.